ECO-11 | Size: 330 ml / 11 fl.oz. This pH balancing trio was formulated as the starting point of a healthy, vibrant skin. Only a well prepared and perfectly balanced skin properly absorbs antioxidants and other valuable anti-aging ingredients from the face products you decide to use. This is why the first three phases from the Excellence D’Ecovital line are also named “skin preparing” or “pH regulators” and they had been conceived as the starting point of your everyday skin care routine. The skin’s pH can range from 0-14 and the health of our skin depends on maintaining the right balance between its acidity and alkalinity. The mantle of a well-balanced and well-prepared skin should be slightly acidic, at a 4-5.5 pH balance. Conversely, our body operates at its best with a pH that is alkaline, from 7.35-7.45. A too alkaline pH might damage the barrier function of the skin, which translates into premature aging, dry, sensitive, dull, itchy, irritated or acne prone complexions. Unfortunately, many skin care products on the market, cleansers especially, are far too alkaline. The Excellence D’Ecovital three pH regulating products are also loaded with antioxidants (Red Grape and Acai Berry Fruit Extracts, Vitamin C, Resveratrol, Melatonin) with outstanding performances in preventing premature aging and promoting a revitalized, youthful appearance. How do the Excellence D’Ecovital pH balancing products work? The Purifying Cleanser - Phase 1 is a non-drying, non-irritating, gel-to-mousse facial wash that leaves skin perfectly clean and conditioned. It is designed to reduce the skin’s pH to 3.9 after washing and to 3.5 after towel drying the face. The Purifying Tonic Lotion Phase 2 continues the acidifying action of the Purifying Cleanser due to its formula based on alpha & beta hydroxy acids (also known as AHA and BHA or salicylic acid). The toner hydrates, refines pores, improves skin texture and clarity and boosts the absorption into the skin of nutrients in later phases. 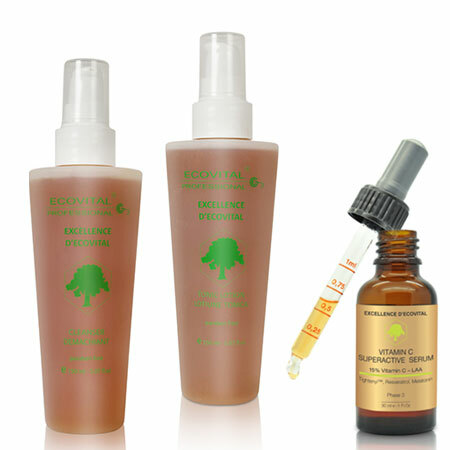 The Vitamin C Superactive Serum Phase 3 is Ecovital best selling product. Formulated with 15% pure Vitamin C-LAA and having a pH of 3.5 it deeply penetrates the skin cells to offer a total skin makeover. It promotes cells’ longevity, reduces the DNA oxidation, neutralizes damaging free radicals, tightens and redensifies the complexion, firms and tones, reduces wrinkles, erases dark spots and unifies skin tone. Having a low pH does not make the three products harsh with the skin. They include calming, soothing and anti-inflammatory plant extracts such as: PHYTOFOAM™ Complex, Aloe Vera and Plantago. After the acidifying stage provided by these three products, we encourage you to continue your skin care routine with Excellence D’Ecovital moisturizers, serums or corrective products that have a pH between 5 -5.5, helping skin return to its ideal state. Excellance D’Ecovital is the most advanced range of products launched by the Ecovital G3 Professional, born out of the desire to offer the most effective anti-aging skincare line to women over 30 years. It relies on over 40 years of experience and research in the cosmetic field, starting with numerous tests concerning the aging process in general and skin ageing in particular performed by the Romanian scientist Prof. Dr. Ana Aslan and her team. Excellence D’Ecovital line aims for the ultimate skin perfection by encouraging the cellular regeneration and encouraging the cellular metabolism as key factors for maintaining skin elasticity, youthfulness and brightness. The formula incorporates the latest innovation in cosmeceuticals to offer visible results for the most common concerns associated with skin aging, starting with dryness, dullness, fine lines or wrinkles and continuing with more problematic ones, such pigmentation and acne scars. The scientifically advanced ingredients are perfectly integrated with effective, naturally-derived compounds to create “clean”, ecologic products. The Excellence D’Ecovital has beeen designed as an integrated anti-aging skincare system: each product facilitates and enhances the action of the other ones. For the best, long term results we strongly suggest you using them as recommended in the treatment schemes. PURIFYING CLEANSER - Phase 1: WATER,SODIUM LAUROYL SARCOSINATE, COCOAMIDOPROPYL BETAINE, VITIS VINIFERA EXTRACT, EUTERPE OLERACEA EXTRACT, COCOAMIDOPROPYL HYDROXYSULTAINE, SODIUM LEVULINATE SODIUM ANISATE GLYCERIN, POLYGLYCERYL 4-LAURATE-SEBACATE POLYGLYCERYL 6 CAPRYLATE/CAPRATE, SUCROSE COCOATE (AND) ALCOHOL, ACACIA CONCINNA EXTRACT, BALANITES AEGYPTIACA FRUIT EXTRACT, GYPSOPHILA PANICULATA ROOT EXTRACT, ASCORBIC ACID, CITRIC ACID, SODIUM EDTA. PURIFYING TONIC LOTION - Phase 2: WATER, ETOXIDIGLYCOL, ALOE BARBADENSIS EXTRACT, GLYCERIN, ALCOHOL DENAT, POLYGLYCERYL 4 LAURATE/SEBACATE (AND) POLYGLYCERYL 6 CAPRYLATE/CAPRATE, VITIS VINIFERA (RED GRAPE) EXTRACT, PLANTAGO LANCEOLATA EXTRACT, SODIUM LEVULINATE SODIUM ANISATE GLYCERIN, EUTERPE OLERACEA (ACAI) FRUIT EXTRACT, SODIUM ASCORBYL/CHOLESTERYL PHOSPHATE, MELALEUCA ALTERNIFOLIA SEED OIL, ASCORBIC ACID, SALICYLIC ACID, CITRIC ACID, LACTIC ACID, MALIC ACID, GLUCONIC ACID, GLYCOLIC ACID, TARTARIC ACID, VITAMIN E TOCOPHERYL ACETATE. VITAMIN C SUPERACTIVE SERUM – Phase 3: ETOXYDIGLYCOL, AQUA, L-ASCORBIC ACID, VITIS VINIFERA (RED GRAPE) EXTRACT, EUTERPE OLERACEA FRUIT EXTRACT, AVENA SATIVA (OAT) KERNEL EXTRACT, GLYCERIN, SODIUM ANISATE GLYCERIN, DISODIUM ACETYL GLUCOSAMINE PHOSPHATE, SODIUM GLUCURONATE, MAGNESIUM SULPHATE (TIGHTENYL™), MELATONIN, POLYGONUM CUSPIDATUM EXTRACT (RESVERATROL).